The break up of the Soviet Bloc in 1989 plunged Cuba into the worst economic crisis of its history. Cuba lost 85 percent of its trade, including both food and agricultural inputs. The conventional system of agriculture was highly dependent on imported pesticides, fertilizers, and farming equipment, and without these inputs, domestic production fell. This decline in food production, coupled with a drastic reduction in food imports, led to an estimated 30 percent reduction in caloric intake in the early 1990s. Cuba was faced with a dual challenge of doubling food production with half the previous inputs. Cuba responded to the crisis with a national call to increase food production by restructuring agriculture. This transformation was based on a conversion from a conventional, large scale, high input, mono-crop agricultural system to a smaller scale, organic and semi-organic farming system. It focused on utilizing local low cost and environmentally safe inputs, and relocating production closer to consumers in order to cut down on transportation costs. By 1994 a spontaneous decentralized movement of urban residents joined a planned government strategy to create over 8,000 city farms in Havana alone. Urban agriculture has been a key part of this effort. By 1994 a spontaneous decentralized movement of urban residents joined a planned government strategy to create over 8,000 city farms in Havana alone. 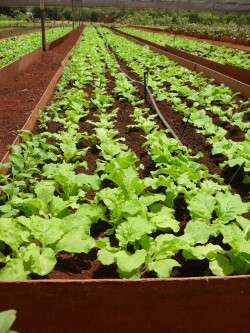 The success of these gardens has significantly contributed to the easing of Cuba’s food crisis. In 1998 an estimated 541,000 tons of food were produced in Havana for local consumption. Food quality has also improved as citizens now have access to a greater variety of fresh fruits and vegetables. Although the program still faces many challenges, urban gardens continue to grow, and some neighborhoods are producing as much as 30 percent of their own subsistence needs. The growth of urban agriculture is largely due to the Cuban state’s commitment to making unused urban and suburban land and resources available to aspiring urban farmers. The issuing of land grants of vacant space in the city has converted hundreds of vacant lots into food producing plots. New planning laws place the highest land use priority on food production. The opening of farmers markets and the legalization of direct sales from farmers to consumers dramatically increased production incentives for urbanites. Deregulation of prices combined with high demand for fresh produce in the cities has allowed urban farmers to make two to three times as much as professionals. The government also encourages gardeners through an extensive support system including extension agents and horticultural groups that offer assistance and advice. Many gardeners were inexperienced in the type of small-scale, organic cultivation necessary for urban production. The extension services helped to educate gardeners and spread the word about new biologically based pesticides and fertilizers and agroecological techniques. Seed houses throughout the city sell seeds, gardening tools, compost, and distribute bio-fertilizers and other biological control agents to small farmers at very reasonable rates. New biological products and organic gardening techniques are developed and produced by Cuba’s agricultural research sector, which had already begun exploring organic alternatives to chemical controls. This emphasis on alternative methods of pest and disease control has enabled Cuba’s urban farms to become completely organic. In fact, a new ordinance prohibits the use of any pesticides for agricultural purposes anywhere within city limits. Cuba now has one of the most successful urban agriculture programs in the world and continues expanding urban production with the goal of putting 100 percent of arable land under cultivation, increasing irrigation potential with new wells and water tanks, and maintaining high standards of quality in all aspects of production. While many believed that when the economy recovered urban farming would disappear, quite the opposite has occurred. In spite of increased food availability and increasing economic recovery, the urban agriculture movement is stronger than ever and growing rapidly. Both the public and private sectors are investing resources in urban agriculture, a sign that it will continue to be part of the urban landscape for years to come.